When it comes to detecting bomb or drugs, generally dog is the first animal that comes in our mind. But would you believe when I say that very soon fruit-fly might be taking over the job of detecting bombs and illicit drugs? Surprised! According to a research conducted by the University of Sussex, fruit fly’s sense of odor can be employed in an innovative technology to expose bombs and drugs. Professor and brain scientist, Thomas Nowotny discovered that the fruit fly nose is capable of identifying smell of drugs and bombs almost as good as wine odor. The flies are instinctively attracted to, as its smell resembles to their preferred food, fermenting fruit. Based on the research, scientists plan to create electronic noses (e-noses) that could copy animals’ finely tunes sense of odor. These new generations of e-noses will be more efficient in terms of sensitivity and will be faster than the e-noses based on metal-oxide sensors that are available now commercially and are very slow in comparison to a biological nose. Professor Nowotny and his teammates from Monash Univeristy and CSIRO in Australia led the study. So far, dogs and bees have been trained to identify bombs, but he and his team are more inclined to find receptors in the animal’s nose that help them to detect odors. Studying fruit flies, researchers noticed that unfamiliar smell of explosives was also registered with the same accuracy as smells from objects that are more connected to a fly’s behavior. For the study, the team noted the response of 20 different receptor neurons of fry flies when exposed to an ecologically familiar set of 36 chemicals related to wine (the wine set) and an ecologically unfamiliar set of 35 chemicals related to perilous material as the one found in drugs, headspace of explosives and combustion products (the industrial set). Team observed the firing rate of each neuron, which aided them to evaluate which odor evoked the strongest response from the fruit flies. Then a computer program was used to simulate the region of the fly’s brain employed for detection to explain that receptor responses carry information enough to identify odors. In the wine set, 29 chemicals out of 36 compounds evoked excitatory reaction in at least one receptor neuron. Interestingly, they discovered that flies also registered 21 out of 35 chemicals in industrial set related to explosives and drugs. Nowotny explains that the future application of the research is to recreate an olfactory sense of animals for technical application, along with its usage in detecting drugs, explosives and chemical weapons. There are other various applications as measuring health (breath analysis), quality of food, geological monitoring (volcanoes), environmental monitoring and agriculture for detecting pests. Though recreating and entire animal nose is extremely difficult to achieve, even acquiring all sensors is too difficult. Researchers might be able to adopt 5 or 10 out of 43 sensors in fruit flies or hundreds in the dog. So it is a challenge for the experts to decide which 10 to choose that would work the best for them. 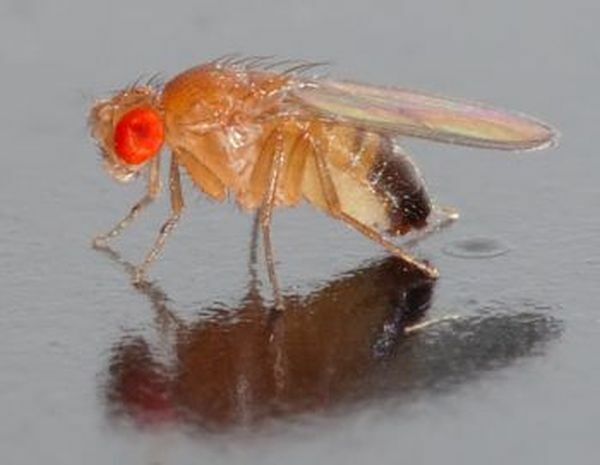 In this research, it was found that 10 receptors can do the required work and the team has probably identified the receptors which 10 fruit fly receptors to be used.